The rose winecup – goblet of blessings by gadi nataf. 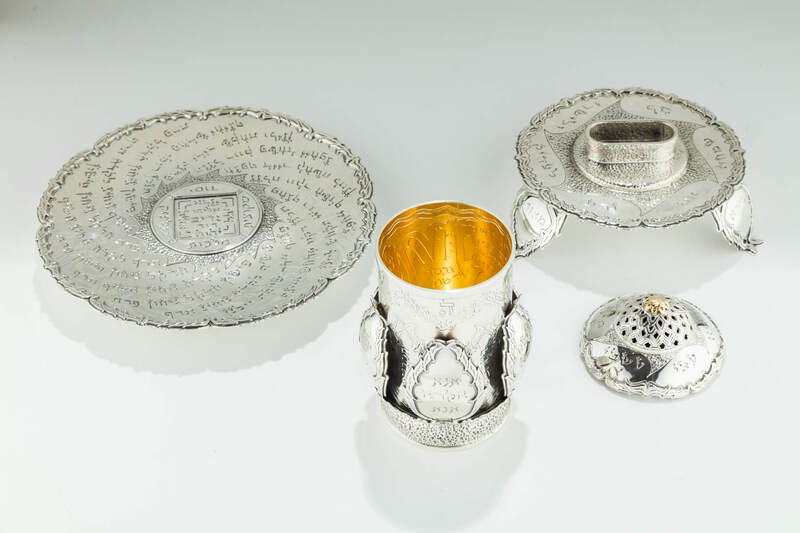 Written by gadi nataf: “g-d willing, i will begin to explain the underlying spiritual significance of the wine cup’s design, which g-d’s great bounty has enabled me to create, granting me both inspiration and artistic ability with gold and silver. It is known that all that g-d has created in this world below is a reflection of elevated matters in the worlds of spirituality above, and the zohar sages use the material of this world to represent and symbolize the spiritual. The zohar’s introduction brings rabbi hezkiya’s words. “as a rose among the thorns, so is my beloved among the maidens (song of songs, 2,2)”: the holy zohar reveals the rose to be a reference to the people of israel and the holy skhinah (g-d’s immanence) which represents the malkhut takhtona (lower majesty). The physical rose manifests the colors of red and white, reflecting the two aspects of khessed (lovingkindness) and gevurah (stalwartness). “כשושנה בין החוחים כן רעיתי בין הבנות” (כב הברכה) (as a rose among the thorns, so is my beloved among the maidens– acronym of blessing 22) ~ white – khessed (lovingkindness) – silver ~ red – gevurah (stalwartness) – gold the rose is composed of thirteen petals, corresponding to the thirteen divine attributes of heavenly mercy, which are an inner form of light revealed in the keter elyon (upper crown) in the middle line, not as khessed (lovingkindness) or gevurah (stalwartness), but rather as a form of the unalloyed mercy by which g-d leads his people due to his great love for them. Love – one – the thirteen attributes are beyond human thought and logic. We cannot grasp the full depth of the mercy flowing from the eternal crown of light. In addition, the rose has five leaves which embrace the thirteen inner petals, reflecting the concept of yeshuot (deliverance): a protective layer of khassadim (lovingkindnesses) that surround the petals during development and growth, enfolding and cushioning them, holding them in until they have emerged from the thorns, and all the scratches and wounds are absorbed by the leaves until the thirteen’s time to be revealed. These leaves correspond to the takif (unrelenting) forms of khessed (lovingkindness) – khessed (lovingkindness), gevurah (stalwartness), tiferet )glory), netzakh (eternity/victory), hod (awe), considered so because they stand firm in the face of the thorns, and protect the rose, thus expressing the aspect of outward gevurot (stalwartnesses), and inner khassadim (lovingkindnesses).the cup is composed of four parts, corresponding to the four letters of g-d’s name, according to kabbalah. Upper kingdom corresponding to the letter “vav” (ו) yetzira (production) – the large plate. 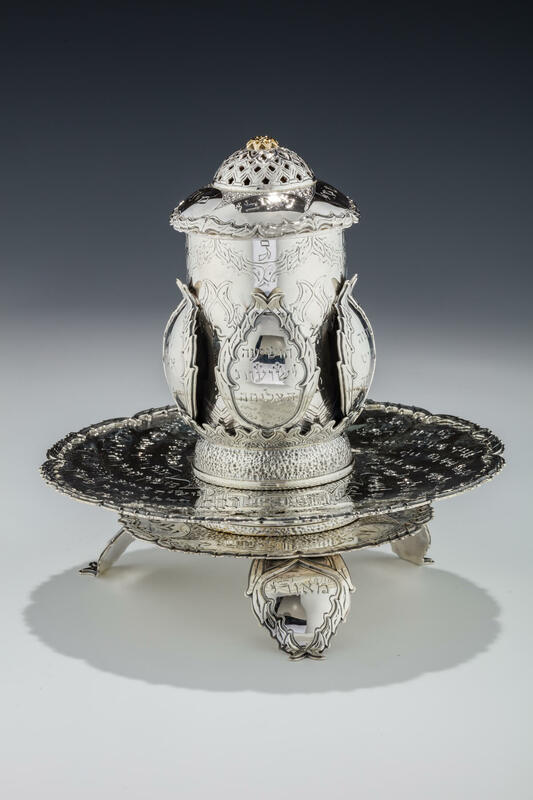 Lower kingdom corresponding to the letter “hey” (ה) asiya (action) – the small plate the cover the cup indicates the three hidden spheres – keter (crown) khokhmah (wisdom) and binah (understanding). The cover is the vessel used to pour three portions of water into the wine, thereby sweetening the gevurah (stalwartness) with khessed (lovingkindness). The interior of the cover is engraved with the star of david to symbolize that the sweetening is done for king david. According to halakha (jewish law) the wine cannot be uncovered, and there is merit in leaving over wine from the first meal for the second; the second for the third, and the third for the havdalah (end of the sabbath ritual). The idea is to leave the wine and expand the blessing from one meal to the next, bringing together the holy forefathers – abraham, isaac and jacob (who each preside over a meal) with king david the malka meshikha (messianic king). The cup the interior of the cup is hand engraved with the kavanot (mystical configurations) of the name of 72. This variation of g-d’s name stems from the khessed (lovingkindness) that flows from the verses “ויבוא” (he arrived), “ויסע”, (he went forth) “ויט” (he pitched [his tent]). These represent the 72 bridges of khessed (lovingkindness) g-d built in this world to bestow a bounty of blessings upon us. The bottom of the cup is inscribed with the kavanot (mystical configurations) of solomon’s seal, or the name of 42, which stems from the verse “אנא בכח” (please, with your strength). This name is part of the takif (unrelenting) form of khessed (lovingkindness), the essence of which is to safeguard the bounty from being siphoned off to external forces. Hence the name “seal” for it seals and protects the bounty and is a talisman for all forms of protection. The exterior of the cup is comprised of five rose petals. The cup is adorned with gold, gems and decorations representing various pshat (direct) remez (symbolic) drash (erudite) and sod (mystical) biblical ideas. The large plate. The large plate is adorned with seven leaves matching the cup’s design, also containing mystical and biblical allusions. On the back of the plate the entire psalm 23, recited before kiddush (ritual blessing of the wine), is engraved with raised letters. Gadi nataf: gadi nataf was born in israel to a tunisian family who made aliyah in 1949. He learned in yeshiva until the army and served as a combat medic. After the army gadi joined his 5 brothers and became a silversmith, creating works of art in silver and gold. Gadi now works with his son and nephew, creating elaborate innovations such as “the ship of mitzvot” and the “magic dreidel.” Gadi uses the unique techniques taught to him and his brothers by their father shimon nataf, who learned from his own father and even older generations. These techniques bring gadi’s handmade judaica works of art to a level no longer practiced in todays’ mechanical world. In a small studio in the heart of jerusalem, gadi nataf painstakingly spends much time on each piece, translating kabbalistic concepts of divine bounty and holy spheres into meticulously hand-crafted judaica. No detail is too small, no part of a piece insignificant. Every tiny detail receives minute attention. The craftsmanship harks back to a time when an artist spent as much time in rumination and inspiration as on the hand work.